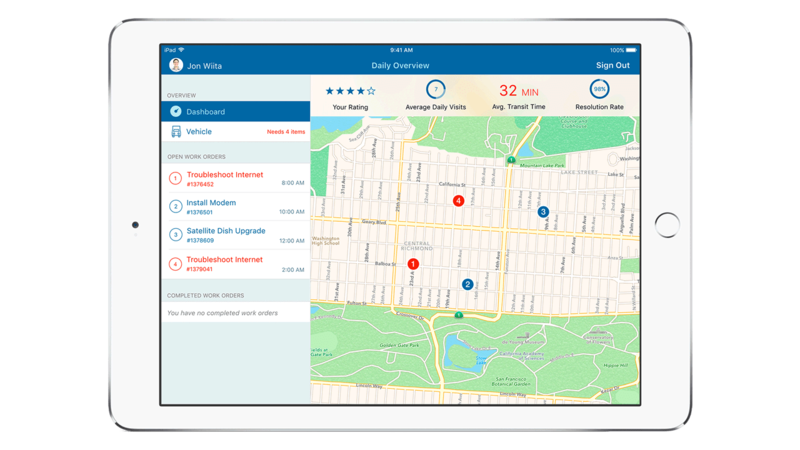 The Expert Tech app provides field technicians with information about work orders, customer history and installation issues to better prepare for service appointments so they can get the job done right the first time. Secure access to inventory and scheduling data is available as well as real-time access to service history, equipment manuals and schematics. Field techs can use location services to map out the day’s route to increase productivity and ensure on-time arrivals. Using the Expert Tech app, technicians can research the customer’s issue and establish the root cause prior to arriving on site. The data can be collected and examined to find commonalities to improve the overall service ─ and power predictive maintenance analytics to mitigate problems before they happen. Built-in camera functionality allows field service techs to add photos to the work order as a reference to further improve work efficiency and knowledge. With Expert Tech, telecom field service techs are able to resolve customer complaints faster with improved understanding of the work order and customer needs. With the app, technicians can resolve issues more efficiently, access equipment manuals and technical data, and collaborate in real-time with experts back at the base using chat or video. Access to immersive, show-and-tell experiences that enable fast troubleshooting and fixes further reduces the need for follow-up visits. In addition to helping fix the customer’s problem, Expert Tech involves the customer in the service call by having them confirm in real-time their issue has been resolved using sign-offs and survey mechanisms. The technician can dictate the incident report on-site to produce more accurate and useful records. This information can inform future service actions for this specific customer or help resolve similar issues for others. Efficiently fulfill service level agreements for enterprise contracts.